At least half the states refuse to hand over data to Trump’s voter fraud probe. Then–President-elect Donald Trump and Kris Kobach, Kansas secretary of state at Trump International Golf Club, Nov. 20, 2016 in Bedminster Township, New Jersey. At least two dozen states are refusing to fully comply with a sweeping request for data on voters by President Donald Trump’s commission that has been charged with investigating unsubstantiated claims of widespread voter fraud. It marks a controversial start for the group that Trump set up last month to look into dubious claims that voter fraud cost him the popular vote in the presidential election. 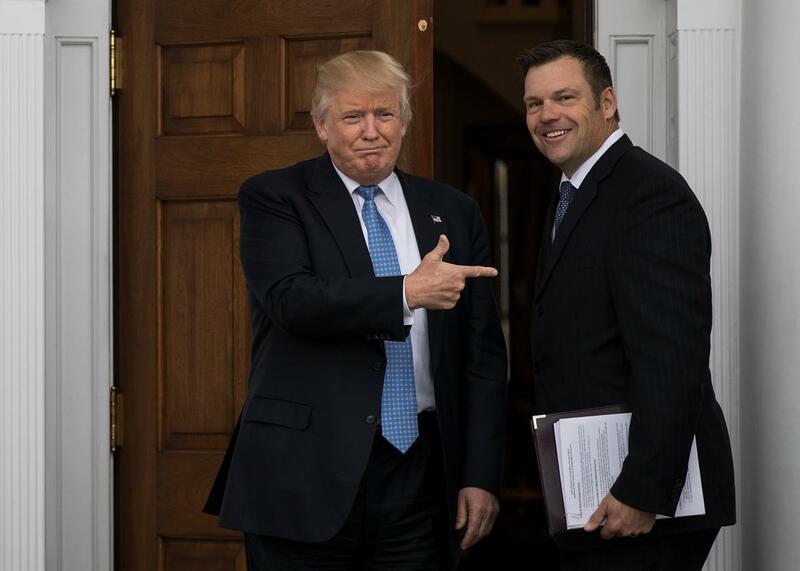 The controversy began this week, when Kris Kobach, the vice chairman of the Presidential Advisory Commission on Voter Integrity, sent letters to election officials in the states to turn over detailed data on voters. The letters requested names, addresses, voting history, and other personal information about voters, such as the last four digits of their Social Security numbers. Some of the most populous states, including New York and California, are refusing to comply with the request for data. Yet it isn’t just traditionally Democratic states that are putting up resistance. Texas, for example, said it would only provide partial information. A spokesman for Vice President Pence, who is chairman of the commission, implied that states are exaggerating their objections, considering the letters sent out this week make clear the information being requested is what is publicly available under state laws. Kobach also made clear that states are the ones that can decide how much information to provide to the commission. “That’s perfectly fine,” Kobach told the Kansas City Star when asked about how some states would withhold certain data. “We understand that. And that is entirely up to each state.” Even Kansas, where Kobach is secretary of state, won’t be handing over all the requested data for now, because Social Security numbers aren’t publicly available.